Our little family is doing something different this Christmas season. Rather than just taking our annual Sunday afternoon trip to Alpine Helen, GA, we are town hopping to attend the many different holiday activities that take place in other small communities. 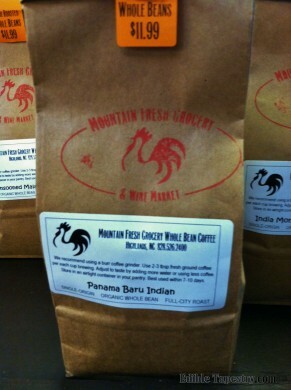 Already we have hit Helen and Dahlonega, GA, and Highlands and Franklin, NC. Still on our list are the towns of Forest City, NC– which looks very much like Bedford Falls from the movie It’s a Wonderful Life– Clayton, GA, and Dillsboro, Hendersonville, and Bryson City in the mountains of North Carolina. When we attended the tree lighting ceremony in Highlands, we were disappointed to see that the town had failed to take advantage of the hoards of local and out-of-town visitors that swamp the high altitude hamlet to share in seasonal festivities. We were there to support small business and to do a little Christmas shopping, but the only owners who were willing to open their doors that evening were restaurateurs and the executives at Kilwin’s who, I’m sure, know that even in small towns it pays to be open past 6 p.m on such an occasion. 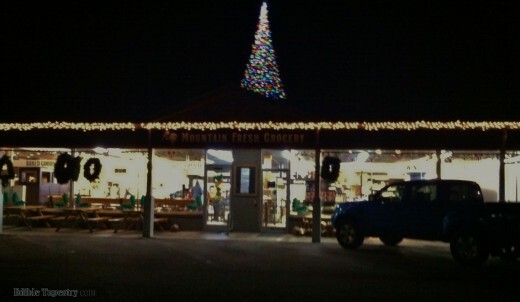 As we parked our vehicle at the far end of Main Street, I was delighted to see that the town’s small market, Mountain Fresh Grocery, was open that evening. 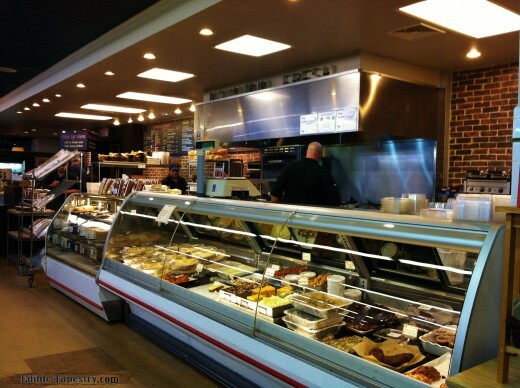 Though I’ve always considered this Highlands market to be “the little shop that we stop in to buy cheese for our waterfall drive picnics”, I am now thinking it should be called Mountain Fresh Grocery & Wine, Wood Oven Pizza, Espresso, Balsamic Vinegar, Produce, Sandwich, Fish and Cheese Market & Bakery. Yeah, I know. Neither would fit on the store’s sign, but, oh wow, has it changed since the last time I stopped by! It’s always been a little gem high in the mountains, but now it’s a gold mine of culinary delights. 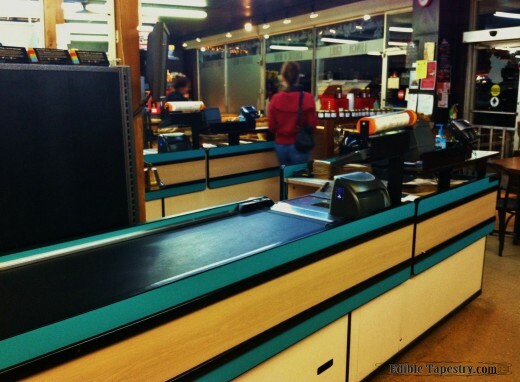 We popped in the front door, intending to take a quick spin around the store and among the familiar stocked shelves, but once inside, we only recognized half of the market. 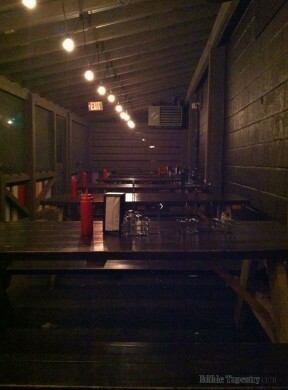 The other portion had been transformed, as if by Christmas magic. That’s when we realized how long it had been since we’d taken a curvy mountain waterfall drive. It was exciting to see that a sandwich counter and espresso vendor had been added, but there in the back was something we just hadn’t expected. 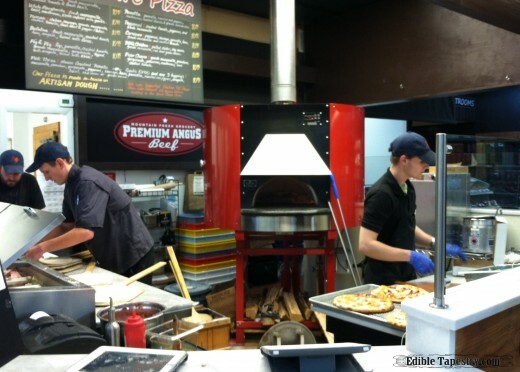 A big, shiny red, wood-fired pizza oven, dominating the corner of an efficient little pizza kitchen, like a 1950s red Buick parked on display under the spotlights of a showroom floor. Beautiful! And pumping out bubbly crusted pies as quickly as they could be shoveled in. I agreed with my husband and boys when they said that we would have to try one of the artisan pizzas when the tree lighting ceremony was finished. After tentatively making our way down icy sidewalks to the center of town to watch the lights on an enormous tree switch on for the first time this season, we purchased a half pound slice of fudge from Kilwin’s, simply to show our appreciation that they were open while most of the other shops were locked up for the night. 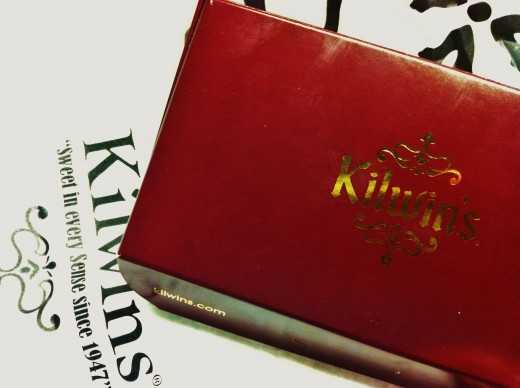 You just can’t go wrong with Kilwin’s. Their Double Dark Chocolate wasn’t as rich as the Black Gold Fudge the boys and I make, but it had the creamy texture of cooked and cooled fudge, that my easy, melt and spread fudge recipes lack. 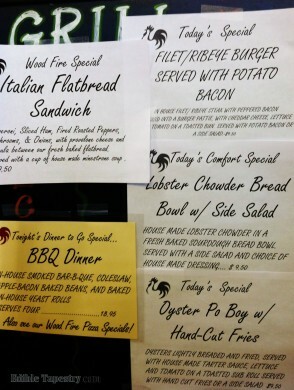 Just a portion of Kilwin’s taste-tempting offerings. 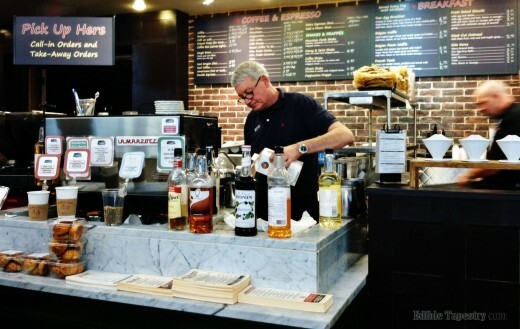 We resisted temptation and decided to keep the pretty burgundy and gold-lettered box of gooey fudge tucked away in its paper bag until after we had a chance to sample Mountain Fresh Grocery’s pizza. Back at Mountain Fresh, we ordered two pizzas, a Tuscan that was topped with red sauce, bell peppers, and sausage, and a White Margherita with pecorino, fresh basil, and mushrooms. While they baked, we made our way around the store for a better look. My boys oohed and aahed over the fish case. 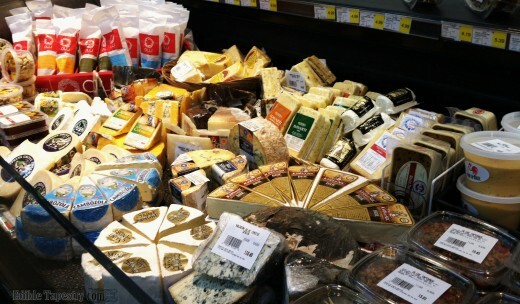 It was impressive, but since cheese was something we always bought at the market, I was more interested in finding where the imported selections were displayed. 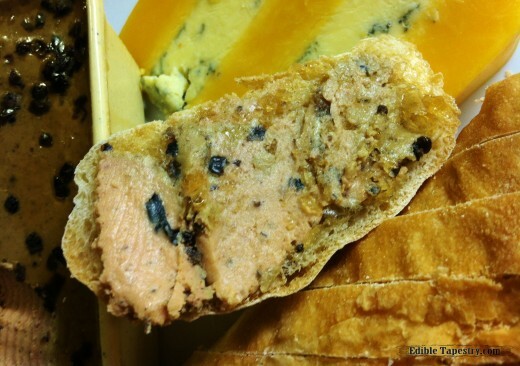 As there was still a loaf of French bread remaining from my Thanksgiving baking earlier in the week, we chose a couple of items to go with it to make a light dinner the following evening when we planned to put up our Christmas tree. 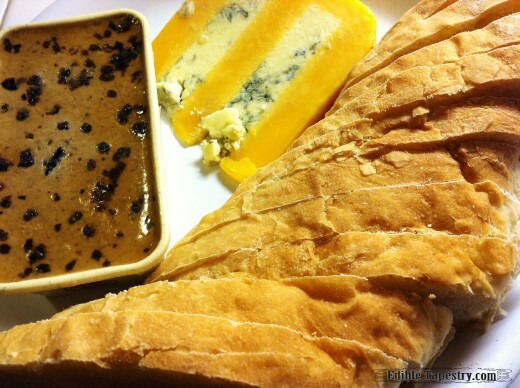 Truffle flecked mousse and a wedge of Stilton and Double Gloucester cheeses with rounds of my home baked French baguette. 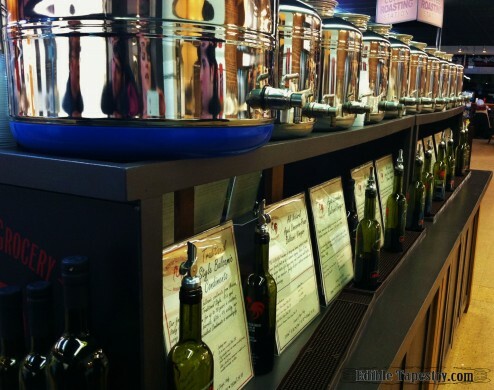 The market carries a large number of wines and vinegars. 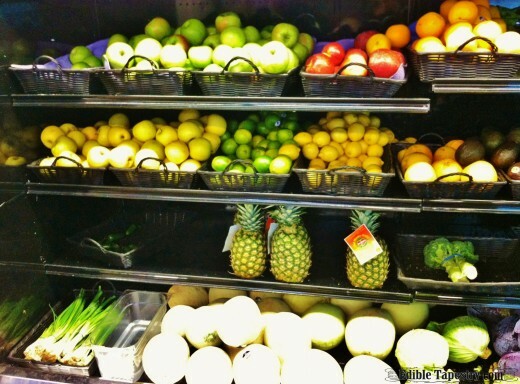 I loved that the produce was displayed in little baskets. 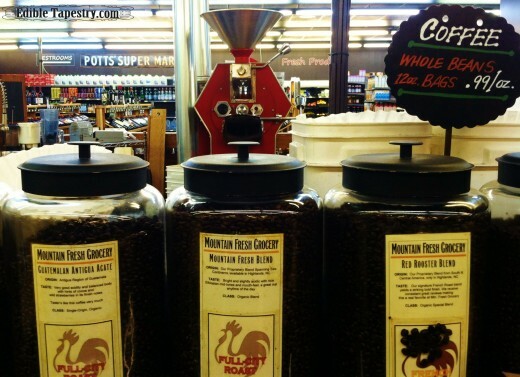 An in-store coffee roaster means fresh, FRESH coffee. 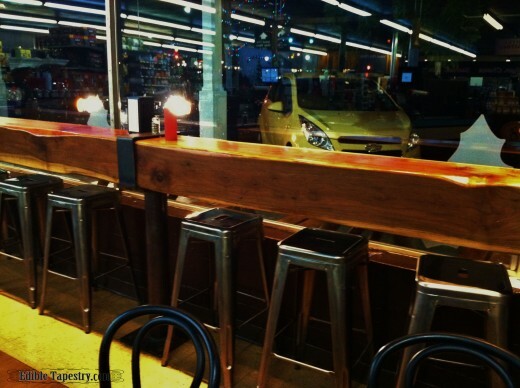 The retro stools that line a massive timber eating bar wanted to go home with me. Too bad they weren’t for sale. While my husband headed to the rear of the store to pick up our finished pizzas, the boys and I discovered an addition to the building. 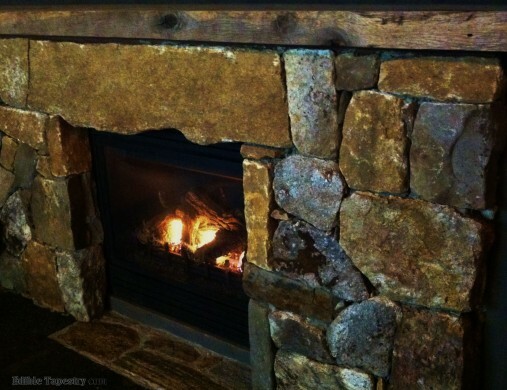 A cozy room that must be cool in the summer, but was toasty warm from the heat of overhead units and a stone fireplace. Perfect on a frozen December night! 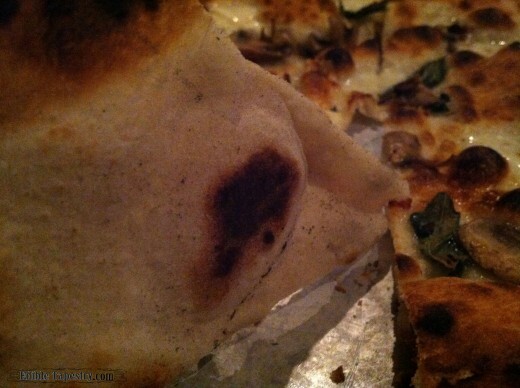 The pizzas were small, as artisan pizzas tend to be. 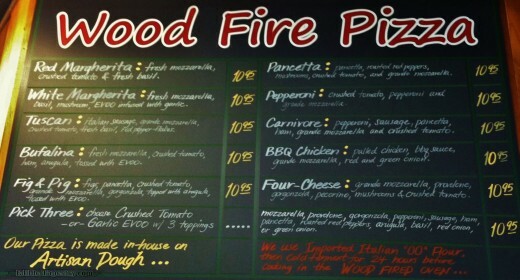 Though a little shy of toppings, the underside of each had the perfect darkened circles that I have come to expect from wood-fired pizza since cooking in a restaurant that utilized a brick oven to make several of the menu items, including pizza. 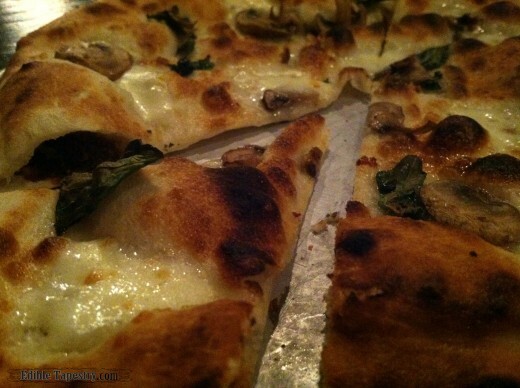 There were possibly six mushroom slices on the Margherita, and maybe four basil leaves, not really worth the money. 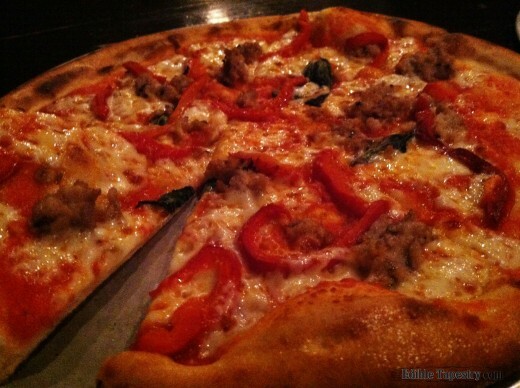 $11 is a lot of dough for a lot of dough, but the Tuscan had a nice amount of sauce and ample bits of sausage. As we were standing to leave, I happened to glance at the food on the table of the family who had settled behind us and was seriously envious of the unusually thick burgers and perfectly grilled panini they were enjoying. And when, as we were heading toward the exit of the store, I saw the sign that the daily specials were posted on, I was mentally kicking myself for the second time in two minutes. “Oyster Po Boy”. Good fried oysters are hard to come by in the mountains. I had a feeling that Mountain Fresh would know how to do oysters right. I’ll find out another time, I guess. Because I am definitely heading back up into the tippytop Highlands community for another stab at Mountain Fresh Grocery’s menu, and maybe some Christmas shopping when the other stores are open. It’s obviously been a while since I’ve been there as well! 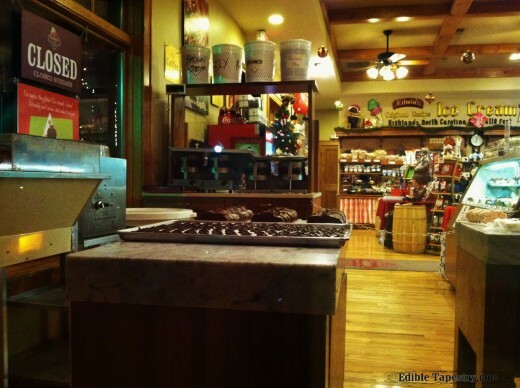 And I should add that Kilwins in Highlands is owned by a local homeschool family. Such sweet people too! You need to head up and take a look! That is so great to know about Kilwins. I’ll buy fudge from them all the time! That’s a very good reason, right? To help out a fellow homeschool mom. Yes. 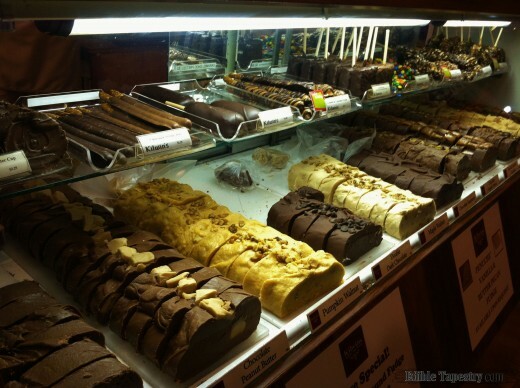 I need to buy lots and LOTS of fudge. I really enjoyed this post. I felt like I was right there with you. It’s been years since I’ve been there. We also were planning a trip to Forest City. I love the town and the horse drawn carriage! Maybe we’ll bump into each other. Preferably not in horse drawn carriages!